You are currently browsing the tag archive for the ‘Gifted kids’ tag. Scientific and educational institutions in this country are stepping up efforts to discover children who show potential excellence in science and provide them with specialized education well before their admission to universities. The aim is to nurture highly talented young scientists who can produce world-class scientific results. The move includes a state-run project that will be launched shortly to provide specialized education for about 700 gifted high school students, using eight universities nationwide as centers for the pursuit of that target. Meanwhile, an increasing number of universities are ready to consider prizewinners in the International Science Olympiads, a group of worldwide international competitions in various scientific disciplines, in the process of selecting successful applicants for their entrance examinations. An important factor behind these moves is widespread concern about the status quo surrounding the nation’s scientific and technological research, according to observers. “I’ve successfully cultivated six kinds of slime molds, or amoeba-like unicellular organisms, for extended periods. It’s amusing to see different kinds of slime molds move in different ways,” said Mana Masui, 12, a first-year middle school student in Suginami Ward, Tokyo. In his home, Masui has been observing slime molds collected from woods and elsewhere since his first year in primary school. In March, the young scientist was invited to publicize his research findings at a symposium at Hiroshima University shortly before graduating from primary school. Masui’s research has been praised by Prof. Ryo Kobayashi of Hiroshima University, who has won the spoof Ig Nobel Prize for his study of slime molds. “His extended observation of wild slime molds is an unusual research project. He also excels in forming a hypothesis and examining its veracity,” Kobayashi said. Masui’s research has been supported by the Japan Science and Technology Agency, an independent administrative institution. The institute’s support is part of a program it launched in 2008 to produce future scientists. In line with the program, Tsukuba University has offered to support about 20 children nationwide who excel in scientific studies each year, ranging from fifth-year primary school students to high school students. Under the program, Masui was chosen during his fifth year in primary school. He has since received individual tutoring from the teaching staff at Tsukuba University. To further pursue its goal, the institute plans to expand the scale of the program in the current fiscal year by establishing centers at eight universities to select from various regions about 700 high school students with a high degree of scientific knowledge. The institute also hopes to form cooperative ties with high schools that have been designated as “super-science high schools” by the Education, Culture, Sports, Science and Technology Ministry. This arrangement will have university teaching staff provide the selected students with individual advice and instruction in their favorite fields of study. Students with excellent skills and knowledge will also be encouraged to study at foreign universities or scientifically innovative high schools overseas and will receive support in their studies abroad. “We want to discover exceptionally talented students,” a ministry official said. 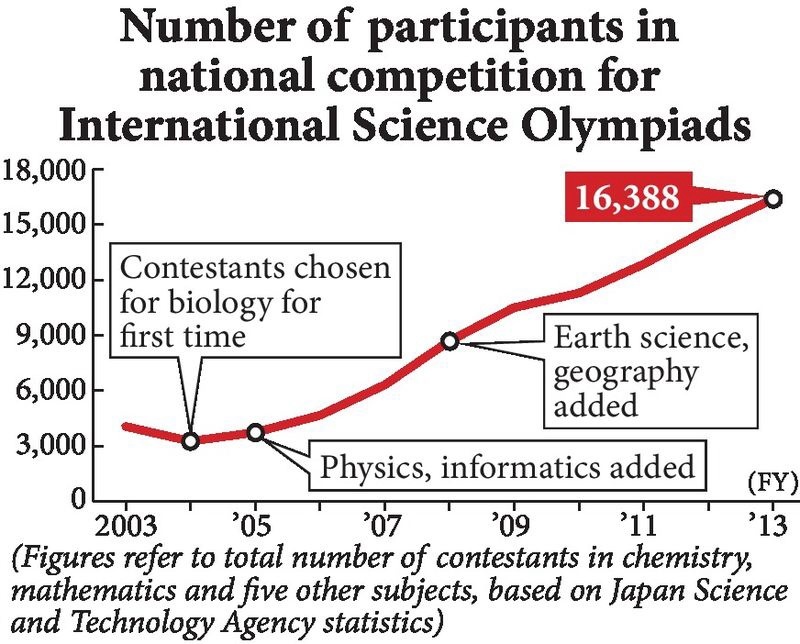 Colleges and universities nationwide are paying great attention to the results of Japanese students who win prizes in the International Science Olympiads, hoping to discover exceptionally gifted students in the country. The ISO competitions, a group of contests among middle and high school students from around the world, test not only the technical knowledge of contestants, but also their ability to create new ideas and think logically. In their entrance exams for the 2014 academic year, according to the Japan Science and Technology Agency, 26 universities, including Osaka University and the Tokyo Institute of Technology, conducted tests designed to emphasize the performance of examinees in past ISO contests, along with regular admissions exams. With the introduction of a recommendation-based admissions test in autumn next year, the University of Tokyo also said it would take into consideration the achievements examinees gained in the ISO competitions. Meanwhile, the medical school of Kyoto University will adopt an early admission system targeting entrance exam takers who competed in the ISO contests starting in the 2016 academic year. The system will target examinees in the second year of high school. Kyoto University will become the second state-run university to enroll high school students who have yet to complete their high school studies, following Chiba University. The latter adopted such a system in 1998. “We hope to give students opportunities to start research activities at an early stage, with the aim of producing personnel who can compete well internationally,” a Kyoto University official said. For years, a number of well-known universities overseas have been ready and willing to enroll people who have competed in the ISO contests. In Japan, an increasing number of high schools hope to encourage students to gain admission to colleges and universities abroad. “The emphasis on the achievements of examinees in the ISO competitions in our recommendation-based entrance exam system aims, in part, to prevent a brain drain overseas,” a Todai official said. The education ministry has been assisting with the management of national preliminaries for the ISO finals. The number of contestants in the preliminaries has quadrupled in 10 years. “It is difficult to discern the ability and aptitude of examinees only through such methods as interviews conducted as part of admission office-managed entrance examinations and a recommendation-based admission system,” Waseda University Vice President Shuji Hashimoto said. He went on to say that “great trust” can be placed in the assessment of ISO contestants, citing the fact that it takes several months to select students to represent Japan in the finals after various screening sessions, including the national preliminaries. Tomohiro Soejima, 19, was rigorously engaged in experiments at a facility at Rikkyo University while attending Rikkyo Ikebukuro High School, a school attached to the university. The facility sits next to his high school. During his high school years, Soejima won a gold medal in the ISO’s chemistry division for two consecutive years. Soejima’s exposure to ISO contestants from other nations led to him gaining admission to the Massachusetts Institute of Technology.